ISTANBUL -- An Islamic State group suicide bomber as young as 12 years old attacked an outdoor Kurdish wedding party in southeastern Turkey, killing at least 51 people and wounding dozens of others, the Turkish president said Sunday. 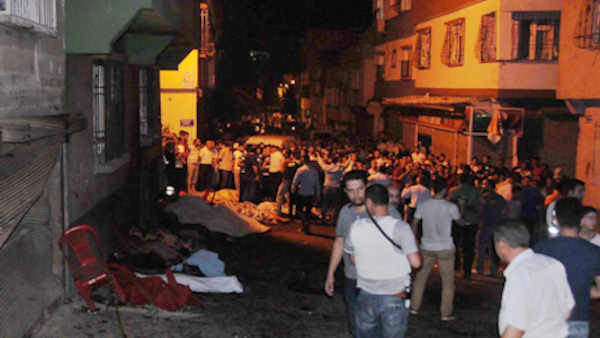 The bombing late Saturday in Gaziantep, near Turkey's border with Syria, was the deadliest attack in Turkey this year. President Recep Tayyip Erdogan, speaking live on national television in front of Istanbul's city hall, said the attacker was aged between 12 and 14. He said 69 people were wounded, with 17 of them in critical condition. "It was clear that Daesh had such an organization in Gaziantep or was attempting to make room for itself in recent times," Erdogan said, using an alternative acronym for IS. "Many intensive operations were conducted, are being conducted. Of course our security forces will be conducting these operations with even greater intensity." The bride and groom weren't in life-threatening condition and were undergoing treatment, Anadolu reported. The groom's sister and uncle were among the dead, the agency reported. Turkey has been rocked by a wave of attacks in the past year that have either been claimed by Kurdish militants linked to the outlawed Kurdistan Workers' Party - known by its acronym PKK - or were blamed on IS. In June, suspected IS militants attacked Istanbul's main airport with guns and bombs, killing 44 people. A dual suicide bombing blamed on IS at a peace rally in Turkey's capital, Ankara, in October killed 103 victims. The attack comes as the country is still reeling from last month's failed coup attempt, which the government has blamed on U.S.-based Muslim cleric Fethullah Gulen and his followers. Gulen denies any involvement. Earlier, Erdogan said there was "absolutely no difference" between IS, Kurdish rebels and Gulen's movement, calling them terrorist groups. "These bloodthirsty organizations and the powers behind them have neither the will nor power to silence the calls to prayer, lower the flag, divide our motherland and break up our nation," he added. Earlier this week, a string of bombings blamed on the PKK that targeted police and soldiers killed at least a dozen people. A fragile, 2 yearlong peace process between the PKK and the government collapsed last year, leading to a resumption of the three-decade-long conflict. In Gaziantep, Deputy Prime Minister Mehmet Simsek and the country's health minister visited the wounded and inspected the site of the attack. "This is a massacre of unprecedented cruelty and barbarism," he told reporters. "We ... are united against all terror organizations. They will not yield." Prime Minister Binali Yildirim condemned the bombing, which he said turned "a wedding party into a place of mourning" and he vowed to prevail over the "devilish" attacks. Opposition parties have also denounced the attack. The main opposition Republican People's Party will be holding an emergency meeting in the late afternoon and a delegation was being sent to Gaziantep by the Nationalist Movement Party. Supporters of the pro-Kurdish People's Democracy Party will be holding a protest against the attack in Istanbul. Hundreds of residents had gathered near the site chanting "Allah is great" as well as slogans denouncing attacks.